How Do You Get The Boiler Antifreeze Mixture Right? What type of fuel filter do I need? What does the Low Temperature Cut-Off Thermostat light indicate? Can I use biofuels in my diesel Aqua-Hot system? Antifreeze and Boiler antifreeze. These two very different. Boiler anti-freeze is intended for use in boiler systems and has a different chemical composition than antifreeze intended for RVs, automobiles and trucks. Camco has pink RV Plumbing and RV Freeze Ban antifreeze in addition to their pink boiler antifreeze; be sure to use the boiler antifreeze in your Aqua-Hot system. These terms are typically used interchangeably. Aqua-Hot heating systems use boiler-designated antifreeze that is rated GRAS — Generally Regarded As Safe. This is the Federal Drug Administration term for Generally Regarded As Safe. GRAS is the term to look for on antifreeze products. Anything else is likely to be harmful if swallowed. Freeze Point is the temperature ice crystals will start to form in the antifreeze solution. Burst Point is the temperature where damage will occur to the coach. Propylene Glycol Boiler Antifreeze In 2002, Aqua-Hot changed the system design and in 2003 systems started using Propylene Glycol-based boiler antifreeze rated Generally Regarded AS Safe (GRAS). All Aqua-Hot Systems manufactured after 2002 must use Propylene Glycol antifreeze, including Hydro-Hot™, Aqua-Hot 250P™, Aqua-Hot 250D™, Aqua-Hot 375D™, Aqua-Hot 375LP™, Aqua-Hot 400D™, Aqua-Hot 400P™, Aqua-Hot 450D™, Aqua-Hot 525D™, Aqua-Hot 600D™, and Aqua-Hot 675D™. DO NOT use Ethylene Glycol or Propylene Glycol automotive antifreeze in these Aqua-Hot systems. Ethylene Glycol Antifreeze Ethylene glycol antifreeze is toxic, does not have the GRAS label and is not suitable for an Aqua-Hot system manufactured after 2002. Ethylene glycol was used in pre-2002 Aqua-Hot systems with the exterior domestic hot water loop design. Ethylene glycol can be used in these pre-2002 systems, as well as GRAS-labeled propylene glycol boiler antifreeze. Why Does The Aqua-Hot System Use Boiler Antifreeze? Unlike automotive antifreeze, boiler antifreeze has a higher boiling point and higher viscosity that helps lubricate the system, as well as the rust, scale and corrosion inhibitors. When properly used, it is capable of efficient and high heat transfer. Aqua-Hot heating systems use either the Camco (pink color) or the Century (green color) brand products. The color your system has depends on the coach manufacturer and the model year of your motorhome. What Brands Of Boiler Antifreeze Are Recommended For Aqua-Hot Heating Systems? Aqua-Hot heating systems typically use either the Camco (pink color) or the Century (green color) brand products. The color your system has depends on the coach manufacturer and the model year of your motorhome. TIP: Don't mix colors in your Aqua-Hot system. Mixing pink and green boiler antifreeze produces a brown color that maybe confused with corrosion, creating unnecessary service expense. How Do You Confirm Your System's Antifreeze? You can check the antifreeze color by looking at the expansion bottle for your Aqua-Hot heating system or draining a little from the drain valve. Aqua-Hot heating systems typically use either the Camco (pink color) boiler antifreeze or the Century (green color) brand products. The color your system has depends on the coach manufacturer and the model year of your motorhome. Where Do You Buy Boiler Antifreeze For Your Aqua-Hot System? Camco pink boiler antifreeze is available directly from Aqua-Hot as well as most RV dealers. Century green is available directly from Aqua-Hot. How Do You Check Your Aqua-Hot Boiler Antifreeze Fill Level and Percentage of Propylene Glycol? Antifreeze Fill levels are visually checked at the expansion bottle when the Aqua-Hot system is warm and level; the proper fill level is at the HOT line. Run your Aqua-Hot system to operating temperature. When it is warm and the coach is level, visually check the Aqua-Hot expansion bottle to see if the antifreeze solution is at the HOT mark. This gives you a true indication of the Aqua-Hot antifreeze solution level. Check the percentage of propylene glycol antifreeze solution in your Aqua-Hot system with a calibrated coolant/antifreeze refractometer. Water will evaporate from the boiler antifreeze mixture over time, concentrating the antifreeze mixture and changing the ratio in the system. 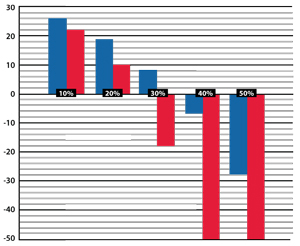 The Aqua-Hot antrifreeze solution should fall between 35% and 50% propolyne glycol boiler antifreeze to water. Too much antifreeze lowers the heat transfer capability, causes sticking check valves in the heating zone lines and may coat the system's interior surfaces resulting in lower water and interior cabin temperature levels. DO NOT exceed 50% propylene glycol in an Aqua-Hot system. Discoloration of propylene glycol antifreeze solution may occur during normal operation of the Aqua-Hot system. This discoloration does not indicate a malfunction of the Aqua-Hot system or the antifreeze solution. It is important to keep the overflow bottle filled to the proper level*. If the Overflow bottle is empty, it must be refilled and the tank must be bled of air*. Air in the Aqua-hot boiler tank may cause the antifreeze solution to discolor. The Aqua-Hot’s antifreeze solution should contain between 35% and 50% propylene glycol. Operating the Aqua-Hot with less than 35% propylene glycol may cause the antifreeze solution to discolor. Please see the Aqua-Hot’s Owner’s manual for instructions on testing the level propylene glycol in the Aqua-Hot’s antifreeze solution*. Adding tap or well water to your Aqua-Hot system may cause the antifreeze solution to discolor. Aqua-Hot recommends using only deionized or distilled water. Using tap or well water may cause corrosion of the Aqua-Hot system. Motorhome manufacturers generally fill the Aqua-Hot with Century brand (green in color) or Camco brand (pink in color) boiler antifreeze. Mixing these two colors together may cause discoloration of the antifreeze solution in your Aqua-Hot. Discoloration of the Aqua-Hot’s antifreeze Solution does not indicate a malfunction of the Aqua-Hot system or the antifreeze solution. Aqua-Hot does not recommend draining and flushing the system unless the wrong type of fluids were added to the boiler fluid. For example, if your system uses propylene glycol “GRAS” antifreeze, but ethylene glycol was mistakenly added, the system would need to be flushed for safety reasons. Use the Propylene Glycol-Based Antifreeze Protection chart to determine the protection you require in your Aqua-Hot system. Freezing Points are temperatures at which ice crystals form. Even below those temperatures, a slushy condition exist which may flow. Burst point is the temperature where damage will occur to the coach; at antifreeze solution percetages above 35%, burst protection is below -50 degrees F.
The propylene glycol antifreeze level of the solution in the Aqua-Hot heating system needs to fall between 35% and 50%. The Freeze Point is the temperature at which ice crystals will start to form in the antifreeze solution. Burst Point is the temperature where damage will occur to the coach. DO NOT exceed 50% Propylene Glycol in an Aqua-Hot System. Inspect your Aqua-Hot system monthly. Run your Aqua-Hot system to operating temperature. When it is warm and the coach is level, visually check the Aqua-Hot expansion bottle to see if the antifreeze level is at the HOT mark. This gives you a true indication of the antifreeze solution level. When you need to add antifreeze, determine the freeze protection you need in the final antifreeze solution and mix your replenishment solution accordingly. This will require a refractometer for accuracy. After you obtain boiler antifreeze with the same color as your current system, it is critical that you determine the antifreeze mixture of the Propylene Glycol boiler antifreeze in your system. Water will evaporate from the boiler antifreeze mixture over time, concentrating antifreeze mixture and changing the ratio in the system. Use a calibrated coolant/antifreeze refractometer and measure the ratio of Propylene Glycol in your antifreeze solution. Caution: Automotive “ball type” hydrometers that measure ethylene glycol in the engine’s coolant system will not properly measure propylene glycol. What Is The Correct Boiler Antifreeze Mixture Ratio? The correct antifreeze solution mixture for protecting your Aqua-Hot system depends on where you are and how cold it is — or can be. Aqua-Hot recommends the antifreeze solution contain between 35% and 50% propylene glycol boiler antifreeze to water mixture. Too much antifreeze lowers the heat transfer capability, causes sticking check valves in the heating zone lines, and may coat the system's interior surfaces resulting in lower water and interior cabin temperature levels. DO NOT exceed 50% propylene glycol in an Aqua-Hot system. Your Aqua-Hot Factory Authorized Service Center will assure the proper ratios. If you do it yourself, check the color. Green Color Ratio? The green color Century brand boiler antifreeze is pre-mixed at approximately 37% propylene glycol and requires NO dilution and it is not necessary to mix Century boiler antifreeze with water before adding it to the Aqua-Hot system’s antifreeze solution. Pink Color Ratio? The pink color Camco boiler antifreeze comes two ways: There's a pre-mixed gallon and a concentrated quart. The Camco pre-mixed gallon has approximately 67% propylene glycol. DILUTION IS REQUIRED to achieve the proper antifreeze to water ratio. Add one (1) gallon of Antifreeze to one (1) gallon of deionized or distilled water to reach a 35%-38% Propylene Glycol Level. Check the diluted level of Propylene Glycol with a refractometer before adding the new solution to the Aqua-Hot system antifreeze solution. The Camco 32oz. concentrate contains approximately 97% propylene glycol. DILUTION IS REQUIRED. Add one (1) quart of Antifreeze to two (2) quarts deionized or distilled water to reach a 35%-38% Propylene Glycol Level. Check the diluted level of Propylene Glycol with a refractometer before adding the new antfreeze solution to the Aqua-Hot system. TIP: Don’t mix colors in your Aqua-Hot system. Mixing pink and green boiler antifreeze produces a brown color that may be confused with corrosion, creating unnecessary service expense. Camco and Century may not honor the warranty of their product if mixed with another comany's product. What Happens If The Green And Pink Are Mixed? Camco and Century may not honor the warranty of their product if mixed with another company’s product. 1. Use the same color boiler antifreeze that’s in your heating system. 2. 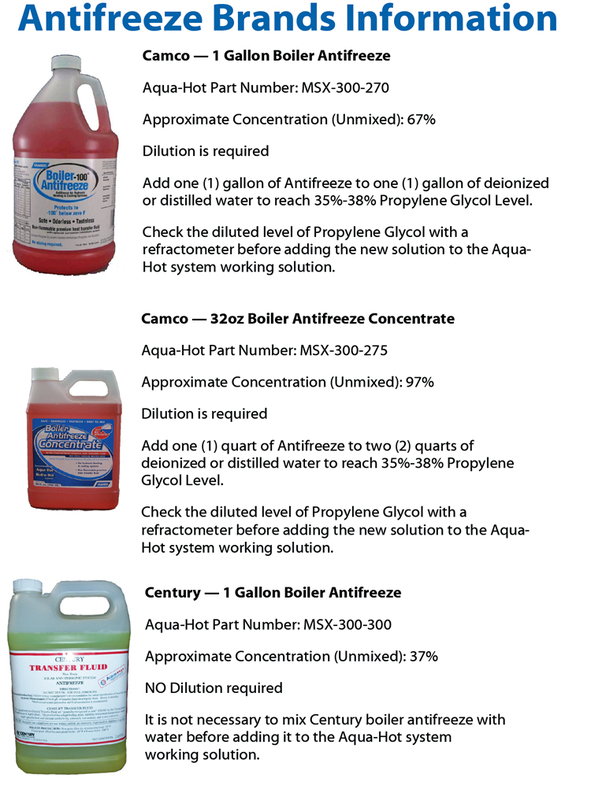 Determine the Propylene Glycol antifreeze protection level you want, using the chart below. 3. Make sure you have the antifreeze amount you need to fill your system to the HOT mark on the expansion tank. See back for details on mixture for your color of antifreeze. 4. Bring your heating system to operating temperature. This prevents the overflow that will happen when coolant is added to a cold tank. 5. 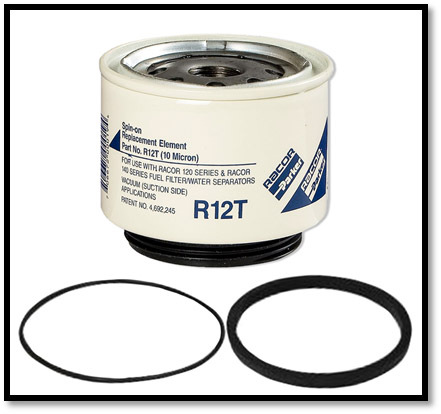 Remove the expansion tank cap. TIP: Solution in the system is very, very hot. Wear eye and skin coverings to protect against splashes or spray. 6. 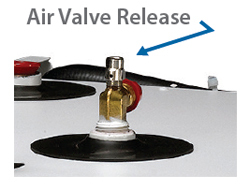 When refilling, open the Air Release Valve located on the expansion tank connection on the Aqua-Hot system to release air pockets; close the release valve when antifreeze appears at the Air Release Valve. Fill until you reach the HOT mark on the expansion tank. Aqua-Hot carries two types of fuel filters. Please compare these two images with the fuel filter in your coach bay to determine which style you need. 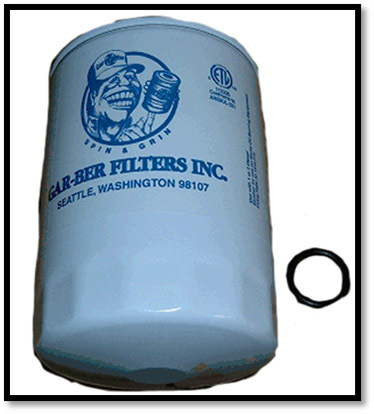 These are discontinued fuel filters, if your clear bowl breaks, please order part number FLX-120-000 to convert to the current style. Part number FLX-120-000 includes mounting brackets. 200/250 Models: When the D4 (LTCO) light is off, the unit is up to temperature and ready to make interior heat. When the D4 (LTCO) light is on, either domestic water is being used, or the system is not yet fully up to temperature. 400/450 Models: A green LTCO light means that the heater is up to temperature and ready to make heat. When the LTCO light is not illuminated, either domestic water is being used, or the system is not yet fully up to temperature. 600/675 Models: The LTCO light will always be illuminated and does not impact hot water or heat functions. Diesel fuel containing a maximum of 20% Biofuel, commonly known as B20, may be used in diesel Aqua-Hot systems. However, please note that it may be necessary to change the fuel filter more frequently as B20 slightly cleans the fuel system. If you need to return parts, you may email service@aquahot.com or call our customer service team at 800-685-4298, option 4. Please be sure to have your packing slip or order number ready. Returned parts are subject to a 20% restocking fee. Aqua-Hot Heating Systems Inc. warrants the Aqua-Hot Heater to be free from defects in material and workmanship under normal use and service for a period of two years on both parts and labor commencing upon the original date of registration of the vehicle. Replacement parts are warranted for the remainder of the Heater’s standard warranty coverage or for six months, whichever is greater. The intent of this warranty is to protect the Heater’s end-user from such defects, which would occur in the manufacturing of the product. Thus, problems due to improper specifications, improper installations, improper use, the use of accessory parts or parts not authorized by Aqua-Hot Heating Systems Inc., repair by unauthorized persons, and damage or abuse of the Heater are specially excluded from warranty coverage. 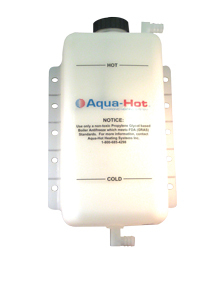 For additional information or to obtain a warranty repair authorization, please contact the Aqua-Hot Heating Systems Warranty Administrator at 1-800-685-4298 (8:00 AM to 5:00 PM Mountain Standard Time) or visit www.aquahot.com. 1. Completely drain the fresh water storage tank. 2. Disconnect the domestic water demand pump’s suction line from the fresh water storage tank. 3. Attach an adequate piece of hose onto the suction side of the domestic water demand pump. 4. Place the opposite end of the hose into an adequate supply of FDA-approved “GRAS” RV Antifreeze and turn on the demand water pump. 5. Open and close all interior and exterior water faucets, one at a time, until only pure RV Antifreeze is present. Perform this procedure for both the hot and cold faucets. 6. Turn off Demand Water pump and remove the hose and reconnect the domestic water demand pump’s suction line to the fresh water storage tank. An FDA approved “GRAS” rated winterization antifreeze must be used. YOU CANNOT BLOW DOMESTIC WATER COIL OUT WITH AIR TO WINTERIZE AQUA-HOT.